A character whose emotions don’t develop or change in a scene is static and not terribly interesting. On the other hand, a character who is jumping from one emotion to another in each paragraph is unlikely to seem believable. So it’s important to create limited, focused changes. The simplest type of a character’s emotional arc is a change in intensity. The basic emotion remains the same, but the intensity of it changes over the scene. For example, a character may feel happy in a scene, but the intensity of his happiness may change, starting at its lowest intensity as calmness and then building through contentment, pleasure, amusement, gladness, happiness, cheerfulness, giddiness, jubilation, elation, joy. Generally, it’s more powerful to show the emotional intensity increasing rather than decreasing. You don’t want to start the scene with the emotion too high, because then there’s no room to build. When you do increase the intensity of the emotion, it shouldn’t happen too quickly–unless something startling drives it–so it seems believable. One common weakness in a character’s emotional arc is plateauing, reaching a certain level of intensity and then just staying there. Every arc doesn’t need to start at the lowest level of intensity and go all the way to the highest–for example, from calmness to joy. You could just as well go from amusement to happiness. But reaching happiness halfway through the scene and then leaving the character stuck there makes the events in the scene seem less important, since they have no emotional impact on the character. For example, a character might be in the happiness emotion arc we discussed above. Perhaps his boss is telling him he performed well over the past year, and as she makes several compliments, the character’s happiness increases from contentment, to pleasure, to gladness, to cheerfulness, to elation when his boss says he’s getting a big promotion. The boss then suggests they should go out to dinner to celebrate. This triggers an emotion switch to a new arc, which we might call fear. He might begin at a very low level of fear, feeling cautious (is this sexual harrassment or is he misreading her? ), then build to nervousness, anxiety, apprehension. Similar to the single-emotion arc, the emotion switch should generally start with the second emotion at a somewhat low level of intensity, so there’s room to increase it. In order for a character to switch from one emotion family to another, the scene needs to offer an important event to trigger the shift. 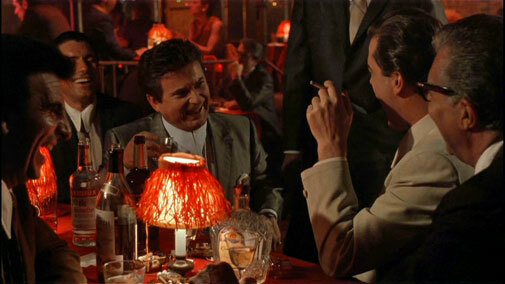 You can see a great example of an emotion switch in this scene from the movie Goodfellas. For those unfamiliar with the movie, these characters are mobsters. Tommy (Joe Pesci, the guy doing most of the talking) is in charge, and he has an explosive temper, as has been established earlier. Watch how Henry (played by Ray Liotta, the guy with the cigarette on the right) becomes more and more happy, until Tommy asks, “What do you mean I’m funny?” There you see Henry’s emotion switch to fear, and you can see it grow and grow. This is one of the strongest scenes in the movie because of the powerful emotions conveyed and the threat underlying everything. …an accumulation of separate feelings from different emotion families that adds up to a singular emotional response. Umbrella arcs describe more complex emotional states. Your character may be feeling several emotions at once within an overarching umbrella. These umbrella arcs may be labeled with conceptual terms, such as abandonment, betrayal, or denial, which are not emotions in themselves but can carry emotions. For example, abandonment may bring with it emotions of hurt, loss, fear, sorrow, and anger. The character may be feeling a combination of all these at once. However, he shouldn’t be jumping back and forth between these emotions. That would feel too random and disjointed. Perhaps he’s feeling hurt, loss, and fear, but the fear grows stronger over the scene, or he shifts from predominant hurt to predominant fear, due to some turning point. It’s important to acknowledge that people experience emotions differently, so “happiness” may not go through the same gradations for one person as for another. Similarly, people feeling an umbrella concept like “abandonment” won’t have the same exact combination of emotions. 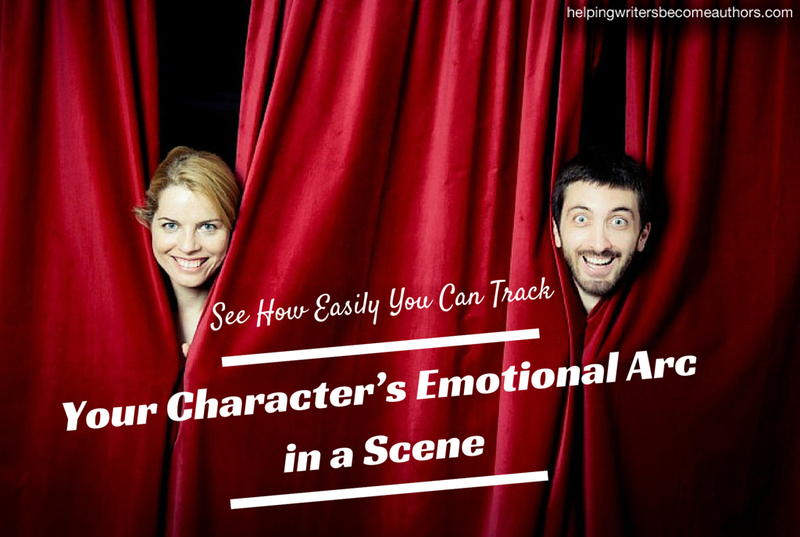 Dig deep to discover the emotions characteristic for each of your characters. What I see often in the work of developing writers are characters whose emotions wax and wane several times in a scene, leaving us with no clear sense of progression–or characters whose emotions move from one feeling to the next to the next with no sense of focus or causal connection–or characters who seem to feel the same emotion at the same intensity through the whole scene–or characters who feel nothing at all. Becoming more aware of how you want to shape your character’s emotional arc in each scene can lead you to much more powerful scenes. Tell me your opinion: What is your character’s emotional arc in your most recent scene? Jeanne Cavelos is the founder and director of the Odyssey Writing Workshops Charitable Trust, a 501(c)(3) nonprofit organization devoted to helping developing writers of fantasy, science fiction, and horror fiction improve their work. She was a senior editor at Bantam Doubleday Dell, where she won the World Fantasy Award for her editing. Jeanne has had seven books published by major publishers, and her work has twice been nominated for the Bram Stoker Award. Thanks so much for sharing with us today, Jeane! For me, I think this is travelling a little too far from the gut emotion, from the heart and soul, too far into analysis and mechanics. I know there are arcs to every scene. When I start writing a scene I know what I want to cover, and then I write it, beginning, middle, and end. When I get to the end something usually pops up that rounds it out or leads it onward. But never do I have to analyse the emotion of it. Usually I edit out the bits that add nothing or are redundant or awkward or ill-fitting, but that’s just a normal part of writing, part of editing. In fact, I do very little analysing – any more than I sit here analysing my own day. It seems to me too artificial for what I write and the way I write it. I speak only for myself here. This article may be of inestimable value for writers who feel the need to “get it right”. I always assume that I get it right. The deserving choice here is what I’d call Croyan’s “realisation scene”. I won’t spoil the nature of the possible realisation (that’s all it is – a reality that’s ‘possible’), but I will argue it to be The Representative’s highlight scene – at least that is in the context that it pertains to Croyan’s actual moment-to-moment present state, and not a reference to his general overarching being. I would make the case however, that as an outright text, The Representative’s an emotional peak. This post just rocked my writing world. Thank you! I’m in edits, and the scene I finished last night had the secondary heroine going from fear and worry (mostly worry) over the man she loves, to resolve to help him no matter what. She’s not letting him shut her out, no matter how hard he tries. It’s in edits that I’m purposely looking at emotions and how to portray them better. When I’m in first draft mode I just go with it and see what happens. I enjoyed this article so much I’m now on the hunt for the book. I tend to be analytical, so this is perfect for me. I’m striving to write character driven books, and the part about the umbrella arc is my take-away here. Thank you! Hi Crystal, I too went looking for this book and found it at a nearby university library, but Amazon also has it. It’s a meaty thing, designed for actors. But has some useful ideas for writers and appendices of examples of umbrella arcs, etc. I’m still wading through it, picking up some things to think about during revision. Thanks, Jeane – very helpful! Yes, I think the appendices are the best part of the book. I love them. Appendix C has sample character arcs. Appendix B has a list of emotions with lots of gradations. Appendix A has sample umbrella arcs. Chapter 9 on emotions has several interesting concepts, mainly in pp. 365-377. Wow, Jeane, I never even considered that. But now that you’ve said it, it’s definitely a very good aspect to look out for. Like Lyn, I write my first draft very non-technically, but I’m just started out to edit my very first long story (a novella) and I think that this advice can be really helpful! Right now, I’m making sort of a scene breakdown to see what I’ve covered and what the scene is supposed to do. Emotional arcs for characters are something I’ll look out for! At the beginning of the scene my protagonist, Dorothy Young, feels fear because she collided with a bully. The bully laughs, along with onlookers, so then Dorothy’s emotions switch to happiness, because she feels like she is part of them for the first time. When one boy shouts a profanity at her from across the room, Dorothy realizes they are actually laughing AT her, which makes her feel both angry and embarrassed. This makes total sense to me. I think, for me, I do this somewhat naturally. Like ebb and flow of water. I just flow with it—especially in the first draft. In editing, I think I dig deeper make sure it flows well. I’m a character driven writer, so emotion fuels my stories. But this gives me something to think about when I can’t get it right. When I know something is wrong, but can’t pinpoint it. It seems that every time I read one of these posts I’m newbie writer with something to learn. I initially react negatively; not in a serious, impairing way. I mean, a part of me just wants to rebel against strict rules. I hear a writer friend’s words every time: ‘there are no rules when it comes to writing’. But that never seems to be the case. Here, someone’s always sprouting some rule or rules that must be obeyed for writing to be considered ‘successful’. There seems to be more don’ts than dos. That’s just my perception – doesn’t mean it’s necessarily ‘true’. And tends to highlight something I’ve said before, that I have a tendency to still write for myself and not for people who may buy my book. I write because I tend not to like what other people write, or, as I did when I first started writing for ‘public consumption’, emulation. I wanted to write like the authors I admired. I learned after writing the first novel that that was like trying to hit a bullseye 700 yards away with a .303. I’m writing my fourth novel and have given up that illusion. This business of managing a character’s emotional arc in a scene seems to me to be one where you’re trying to predict the character’s emotional state before the character enters a scene to act – nice if you know where your character is going before you get into the scene. You can always toy with until it works. But if you only have a general idea – in your outline (if you have one) you have the character being arrested in this scene – then you only have a general idea about the emotional arc of the character. I suppose you can change it in the first read through upon thinking it’s emotionally flat (for an arrest scene). But it may also depend on the character, right? And what the character wants in the scene? If the character is deliberately behaving a particular way (and not the way you might expect in a typical arrest scene) because her personality type is ‘I’m not going to get emotional here’ because she doesn’t want something else to happen, well that makes for a complex character, right? So emotions happen in the moment, right? I mean, if the character’s emotional state is ‘I’m chillin” for a whole scene then it seems you may think that is an emotionally boring scene, and probably an uninteresting scene because there’s no emotional wave, no ‘drama’. My inexperience may be showing here – my confidence slips when people imply ‘you’re doing it wrong’ if they don’t find something they want/expect in every scene – but I’m still learning how to be a ‘good’ writer. So I think what I’m saying is that it all depends on the character, not necessarily the scene, because if the scene dictates the character’s behavioural and emotional response then it may result in a stereotypical character response and not necessarily what the character wants/needs to do in this particular scene due to what happens next. One of many ways to bring life to your story’s characters. I’m glad some of you are finding this helpful. Some writers, who are plotters, may have an idea of the emotion arc they’re going for in a scene on first draft and can try to create that as they write the scene. For most writers, I think this is a technique to incorporate in revision, as you examine how the character’s emotions are currently developing in the scene. You will probably see some of the weaknesses I discussed and can then brainstorm possible ways to strengthen the arc. I didn’t intent to present this as a rule to be obeyed, but as a principle that tends to generate more powerful characters and scenes. Any principle can always be violated, if the author gives the reader something better in return. I definitely agree that the emotions must always be true to the individual character. But if your character is one whose emotions tend to be flat in most scenes, or whose emotions tend to constantly jump from one feeling to another, that character may not be very compelling to your readers. Some scenes will have more minor arcs than others. As I mentioned in my article, you don’t have to go from the lowest end of the arc to the highest in each scene; that would be unbelievable and seem melodramatic. But having some degree of emotional change in a scene can help show the importance of what is happening to the character. I think that was directed at me, and fair enough, given my response. I suppose I should’ve said, which I often don’t, even to K’s posts, that I very much appreciate it when someone takes the time to make interesting points and discuss them. It’s been remiss of me. I will say it here: I appreciated what you said, Jean. My response to your post should be seen as me caring about it a lot. If I didn’t care I wouldn’t respond. Some people don’t, I do. I actually agree with what you said, though I saw it initially as a ‘rule’: ‘I didn’t intent to present this as a rule to be obeyed, but as a principle that tends to generate more powerful characters and scenes. Any principle can always be violated, if the author gives the reader something better in return.’ And that is the challenge. We, as writers, want to create characters our readers will care about – care to love, care to hate, care to scream at, cry with, be angry with, fear for them…and there are so many suggestions out there about doing this. As a writer and a drama teacher I can see how the Book on Acting would be helpful because every scene a character must show his/her emotional movement and connect with the audience. If I apply this concept to writing a scene in my novels than perhaps each scene will be charged with the right emotional arc for my readers not only to stay invested but to remain curious to watch the characters over all development emotionally? Thanks for this suggestion may I pass this link or suggestion onto my readers at my blog Historical Fiction Addicts? Please feel free to share this link with your readers and other writers you know. I agree that the technique can not only help on the scene level but can help you to develop the overall emotional arc of the character in the story or novel. When we feel the character being challenged, and that challenge eliciting building emotions, we can become very involved. Fantastic post, Jeane. The emotional arc is such a simple concept, but way too easy to overlook. I’ve written many scenes where something just doesn’t seem to be jiving, and then I realize that I honestly have no idea what the main character is feeling right now. One of my revision stages for my last novel will be to examine each scene and map out a tangible emotional arc for the most involved characters. That’s a problem I have sometimes too. And sometimes critiquers will tell me that they aren’t feeling the emotional impact of what’s happening on the character. That’s one of the reasons I was so excited to discover this concept. Now I write down what I think the arc is before I revise a scene, so I can keep it in mind and then check to see if I’ve achieved it after I finish. This was a well-thought out post regarding how to develop the emotional arc of a character in a scene. Some of the comments reflect a certain dubiousness when it comes to analyzing character emotion this way but I never presumed this kind of character analysis should occur DURING the writing process. If you’re analyzing while you’re writing, you’re likely going to develop stilted characters. But this post can be useful during the editing process, when you’re trying to figure out how interesting your characters will be to your readers. If they “flatline” emotionally, your readers will probably check out due to a lack of interest, and I took the post in that spirit, i.e. don’t let character emotions flatline! That’s very good advice. Was there supposed to be a link, though, to the Goodfellas video? I ended up going to YouTube because I couldn’t find the link in the post. The scene is a great and memorable example of what you’re discussing here…I haven’t seen Goodfellas in probably 15 years but I remember that scene VERY well, probably because of the point you’re making here–it shows a sharp and very jarring arc of emotion. You bring up a very important part of writing scenes. If I may add, characters in a scene should also have opposing goals, each trying to achieve their goal above the other. If you read bestsellers they all have emotional arcs to their scenes as well as opposing goals. Thanks! You’re absolutely right about the opposing goals. That’s a powerful way to create conflict and emotion. Another option is for the characters to have the same goal but disagree on the proper method of reaching the goal. Or the POV character may think they have the same goal, but we know the other character has a different goal and is hiding it. That can be a great way to generate suspense. I am a student in Stephen Book’s acting workshop, and his techniques are great for analysis, as mentioned in this article. The Purpose of Scene work we have done is a great education in breaking down the emotions of a scene. Highly recommended for writers.